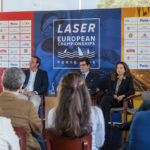 A new round of 2017 Laser Europa Cup started today in Hoorn, Netherlands. More than 150 boats were launched at 11:45 for the first warning signal at 13.00. During the night we had heavy rain and thunderstorms and during the morning the rain continued. 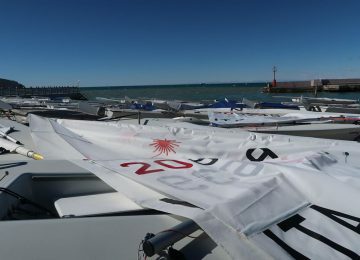 But during launching the sun arrived and wind was SW/W with 12-15 knots. 13.05 was the first start with Standards, good start. The following groups did not succeed under “P”. So next starts were under “U”. There were also some boats scored as UFD. 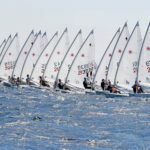 All races were sailed in a wind direction of 270/250 degrees with a wind speed of 18/20 knots and gusts up to 22 knots. Back on shore the club created a table with pasta and water. 1 protest was filed, but it was a scoring problem. No questions were placed at the info desk. 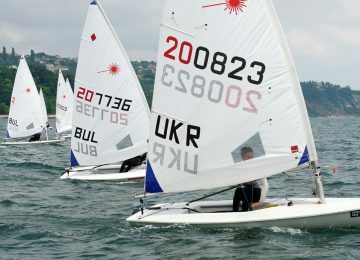 That’s score marked today by Cesare Barabino ITA for leading the Laser 4.7 class and U16 championship with 6 points. Just 4 points behind is Julian Hoffmann GER (2-7-1) with 10, also second in U16. Third place overall and also U16 for local Willem Wiersema NED (6-3-10) with 19. Fourth place overall and U18 provisional leader is Barend Van der Starre NED (14-4-7) with 25 units. 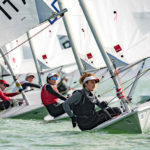 Giorgia Cingolani ITA (12-22-31) leads women fleet with 65 points and ranked 17th overall. 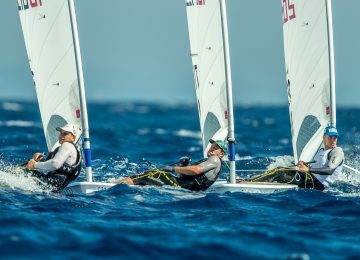 Irish sailors Johnny Durcan IRL (1-5-2) and Ewan McMahone IRL (3-3-3) are leading the Laser Radial class and U19 category with 8 and 9 points respectively, closely followed by Marcin Rudawski POL (7-2-1) in third with 10. 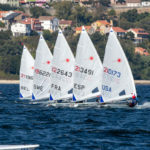 Hannah Snellgrove GBR (12-4-4) is fourth overall and leading Women competition with 20 units. 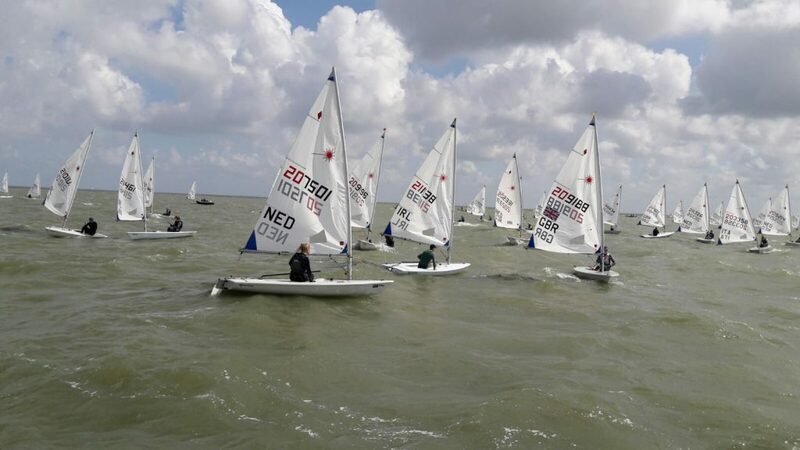 First day back was today and it was a baptism of fire with windy choppy conditions on day one of Hoorn Europa Cup in Holland. 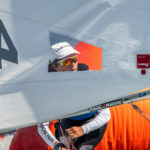 Really happy to be fairly quick despite being much lighter than when I was sailing full time. Bit of a seaweed-on-centreboard incident at the end of the first race to lose 9 boats just before the finish but that’s sailing. Need to get some hiking stamina back to stop letting the boys overtake me! But most importantly, was fun to be back. Gauthier Verhulst SUI (11-19-15) is leading U17 ranking with 45 points and placed 9th overall. 3-2-1! 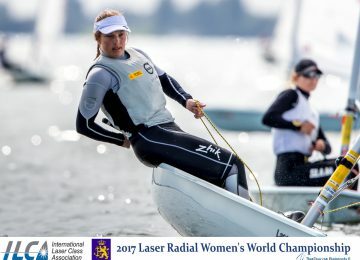 Laser Standard, here they come! Tomorrow the first warning signal shall be given at 11.00 hours so stay tune! 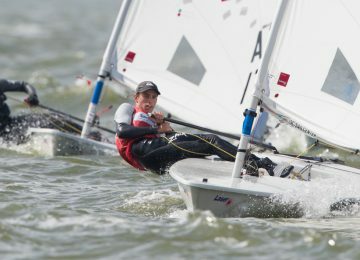 By Agustín Argüelles – EurILCA | Source/photo: Henry Sleutel / WSV Hoorn.